Sometimes the world comes together just the way you need it to. I had a bunch of bananas going over-ripe on the counter, a recipe from pinterest I was dying to make, and a need to bake to restore a sense of normalcy after some sad news. 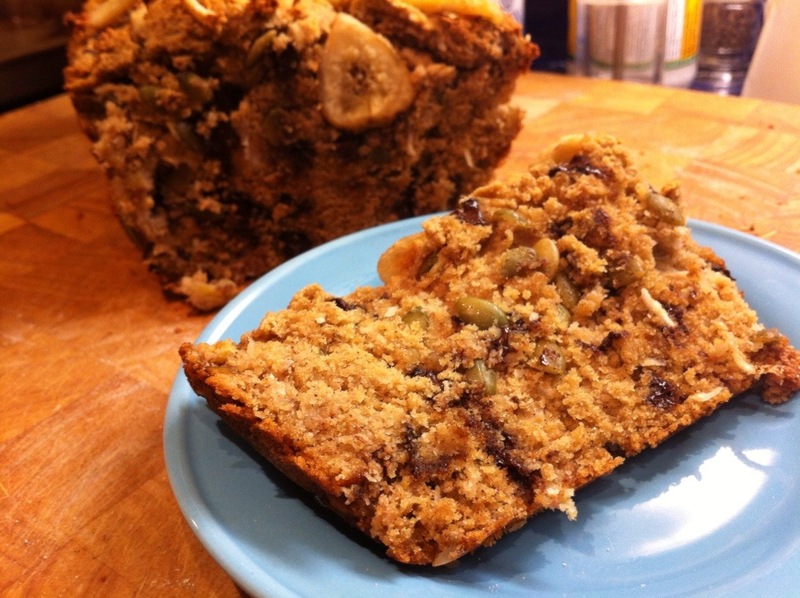 And so I went into the kitchen to recharge, and came out with banana bread. Perfect. Lea’s original recipe is suitable for a Paleo diet, which means it was grain-free. That made it a perfect jumping-off point for a gluten-free banana bread, which I’ve been totally craving. I went gluten-free just weeks after inventing my new love: Whole Wheat “Kitchen Sink” Banana Bread, and so I needed a replacement. 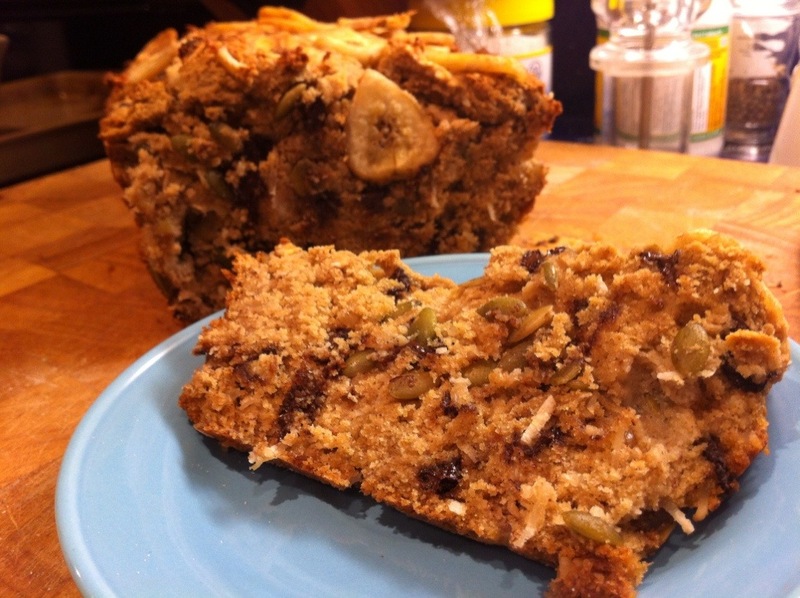 I wanted to keep the “add in everything but the Kitchen Sink” aspect of my wheaty banana bread, and so added a whole bunch of “mix-ins” to the batter: chocolate chips, coconut flakes, walnuts, and pumpkin seeds. I think it makes this bread. I got a chance to try out my homemade Bourbon Vanilla Extract here — my verdict after 3 weeks in the cupboard is that it’s useable (and smells so good), but not quite vanilla-y enough yet. I think another couple weeks will make it just perfect! And the four types of coconut? Divine. Coconut flour, coconut oil, coconut flakes, and coconut nectar. If you can’t find coconut nectar, maple syrup will be a great sweetener here. (I happened to have some coconut nectar in my cupboard and had run out of maple syrup — I use them interchangeably). I highly recommend serving this to friends when they pop by for coffee or tea. Americanos and banana bread are just perfect in my world. In a large bowl, whisk together dry ingredients (almond, quinoa and coconut flours, baking soda, salt, and cinnamon). In a separate bowl, combine wet ingredients (bananas, eggs, coconut nectar, coconut oil, and vanilla). Use a spatula to combine wet and dry ingredients until smooth and no lumps remain. Add the mix-ins (chocolate chips, walnuts, and pumpkin seeds) and fold in with the spatula until incorporated throughout the batter. Pour the batter into the loaf pan, and smooth the top of the batter with the spatula. Stud the top of the bread with banana chips, and press them into the batter slightly, so they stick. Bake at 325F for 50-55 minutes, or until a knife inserted into the centre of the bread comes out clean. Let cool in the pan for five minutes, then remove from the pan and cool on a wire rack. Enjoy — and keep any leftovers in the fridge.